It's very interesting to come all the way from the UK to a conference of this kind, which is taking a strategic view of technology education. I don't think such a conference has ever taken place in the UK at all, although many people have been involved in thinking about agendas for research, the University of Leeds, for example. Ironically this was drawn up by a group of science educators. There is a very strong tradition of science educators doing research, in contrast to the situation in technology, reflecting for me the difference between technologist and scientists perfectly. Technologists are the doers, and the scientists are the researchers, and I think we carry that through into what we do in fields of education. Technology educators do a lot of curriculum development, but much less research about what goes on when the developments take place. This paper will be in four sections. First of all, I will outline the theoretical and empirical issues for research in technology education. Second, I will look at some types of knowledge—procedural and conceptual knowledge, which stem from the theoretical issues—in relation to researching technology education. I will effectively be giving you a case study of the research that my colleagues, in particular Patricia Murphy, and I have done at the Open University. I want to do this because it is important to ground discussions in actual research, as opposed to just talking about it. Third, I want to explore a particular approach to knowledge, that is, qualitative knowledge and qualitative reasoning. Fourth, I will outline various approaches to research and how these might relate to classroom change. Finally, I will suggest a brief list of questions that could contribute to an agenda for research. The first theoretical issue concerns the definition of technological knowledge and what the nature of that knowledge should be. The debate on this has been going on for some time; it was a major concern at JISTEC (Jerusalem International Science and Technology Education Conference) in 1996. The concern was to work out a map of technological knowledge. I don't think that is going to be very productive, as it is a very large issue. My concern here is with how we define and think about that knowledge. The second theoretical issue is to explore the relationship between learning and knowledge. We often see knowledge as “out there,” as something to talk about and map; but that stance has a particular view about learning encapsulated within it, and a particular view about the mind. This view of learning and mind is legitimate, but not one that I happen to share. My view is that we need to see an inter-relationship between learning and knowledge. The first of the empirical issues is that part of the problem about seeing an inter-relationship of knowledge and learning has to do with the nature of context: where we learn, the context within which we learn. Such a view of context is extremely difficult to research. Science educators researching misconceptions are concerned with abstract knowledge, and are trying to establish whether the student has a grasp of these abstractions. Those interested in knowledge in context cannot “strip the context out,” which is what the science educator does. This stripping away of context is necessary to the science educators because it is “unimportant.” This stance is problematic in technology education, and hence an important empirical problem. My second empirical issue concerns research. I think we need to be concerned about how the research relates to change in the classroom, and how that change takes place, rather than just with methodological issues, and I will explore that briefly at the end. First let me explore two basic types of technological knowledge: conceptual and procedural. Procedural knowledge includes such things as: design, problem solving, planning, systems analysis (approach), optimization, modelling, strategic thinking (heuristics v algorithms v metacognition). The Benchmarks deal with a limited range of procedural knowledge in relation to technology: design and problem solving. But there are many other procedural aspects used in technology. However, we know very little about them. Not only do we not know how technologists use them in a way that we could draw upon them as tools in education, but also, we don't know their inter-relationships. Nor do we know whether they are of the same kinds of thinking or level of cognition. I'll say more about this later. Most people would assume there must also be conceptual knowledge in technology. But are there particular concepts related to specific aspects of technology or more general concepts across all of technology? Systems knowledge, recognised in Benchmarks as conceptual knowledge, is very abstract. Considering technology as a generality (rather than a particular technology), then we have to ask “What are the concepts that apply across all technology?” There is a problem in coming up with a very good list. “Systems” is a perfect example of the difficulties. A control system is a particular view of a systems, both as a way of analysing the world (as procedural knowledge) and as a conceptual framework. If you are dealing with an air traffic control system, or an airport as a system, then this involves human systems; the interaction between human, physical, and other kinds of systems. This requires ideas of “soft systems approaches” and they work in a completely different language from say “feedback control systems” in electronics. How useful, then, is the generality of the concepts of systems? Whatever the difficulties of particular concepts in technology, it is important to recognise that they may differ from those in science. The concepts that are important to technologists are not the concepts related to theories, such as kinetic theory of gases, but related to laws (such as Boyle's law). Driver et al. (1996) make an important distinction between theories and laws. The laws are the empirical relationships: stress, strain, Young's Modulus and so on. They are the focus of a lot of technological concepts (I will come back to this later when I consider how the benchmarks represent technological knowledge). Now, they happen to be particular concepts, because they relate to particular technologies or areas of technology. In food technology, there are a different set of concepts. Thus in defining the nature of technological knowledge we need to clarify if we are discussing particular concepts (special to particular technologies) or whether they are generalities. If we are interested in technological literacy, we are not interested in people being expert in particular sets of technologies. That is a great tension for us in relation to technological knowledge as part of literacy for all children and young people. I will deal with both procedural and conceptual knowledge, starting with procedural knowledge, using some of the work on problem solving in technology classrooms that my colleagues and I have done at the Open University. In Britain we call the curriculum subject “design and technology”! This is partly to encapsulate this notion of the processes (design) being involved—it happens to be the design process that is the dominant kind of procedural knowledge but, as I will show, it is not quite as straightforward as that. Why did we pick problem solving? Well, it's about the most important procedural knowledge that occurs in technology, and indeed, in many other areas of activity. It is very interesting that the benchmarks on design and systems mention problem solving more than design. The notion of “clarifying the problem, thinking of alternatives, implementing it and evaluating it” is the language of problem solving, not of design. (Elsewhere I have discussed this distinction; McCormick, 1999a.) Another reason it is important are the many claims that technology education will improve or encourage children's problem solving. Almost any technology education curricula you look at in the world will have problem solving as an important part. Although it is central, we know almost nothing about it in the classroom; a difficulty that is not unique to technology education. For example in science the most recent review of research on problem solving was in 1988 (Garrett, 1988). There has been very little work on the nature of science problem solving itself, rather than as a way of learning conceptual knowledge. Mathematics has more (e.g., Hiebert et al., 1996; Schoenfeld, 1988). Before I describe some of our approaches and findings in problem solving in technology I want to say something about our orientations in relation to learning. Conceptions of learning inform views of problem solving in the classroom. Cognitive psychologists, who may take an information processing approach to learning, view the brain as a store for concepts; these concepts are selected to suit a situation (a problem) and applied. That is a particular view of mind, and not a view that I share. Nevertheless their findings are important and here I will only briefly indicate them. First, that knowledge is domain specific (e.g., Glaser, 1984 and 1992). In the area of technology education where we deal with many technologies (domains), that becomes an important issue. Second, strategic thinking and the nature of such processes (procedural thinking), can be seen in terms of heuristics, algorithms and metacognition, which can be seen as an hierarchy. Heuristics are “rules of thumb,” that is procedures that usually, but not always, work; they are a good rule of thumb to use. We teach students these all the time in classrooms. We also give them an algorithm and we say, “Do this, do this, and then this, and this, and it will work every time.” A lot of mathematics is taught like that. Sometimes we teach design like that; it doesn't often work, but we pretend it does, a point I will come back to. Metacognition is, as the name suggests, where you can monitor what you do, to become aware of what you are doing. “Should I do this or that next?”: This is a reflective or self-regulation activity but we very rarely find that kind of reflective talk going on in classrooms. Take the example of a “fair test” in science, where students are taught to do fair tests, but few teachers ever discuss the question: “When do you use a fair test?” So students may never know when to use such tests—the teacher always tells them and they don't develop metacognition. In design a similar situation exists; for example, “When do you stop generating ideas?” Is 10 enough, 15, 20 enough? Who knows? It is usually 4, perhaps because it is possible to divide a page into 4, and put the 4 ideas there. But there is rarely a debate about this in technology classrooms. For example, students could each have one idea, but share the ideas and discuss why this is useful. These insights from cognitive psychology still leave an important difficulty for me: what constitutes the nature of the problem that they're going to involve students in solving? Cognitive psychologists who research problem solving use bizarre problems for subjects to solve; getting people across a river in a boat that only carries 2 and asking how they can all get across (the “missionaries and cannibals” problem, Reed, Ernst and Banerji, 1974). There are many of these complicated tasks, which are very carefully controlled, but which bear no relation to real-world problem solving outside the laboratory. There are of course exceptions, for example, Gott, 1988. A second difficulty arises from the question; who is it a problem for? A researcher gives a problem to a subject, as they are called in the cognitive psychology area. The subjects may care nothing about this problem, it is not their problem, but this researcher has given it to them, and they'll get on with it, and they'll do it because they are compliant people (and may even be paid to do it!). Students in classrooms are as compliant as this most of the time. Teachers give them problems, but they may not be problems to the students. Their problems may be something quite different, and that is a very important issue. So much for cognitive science, now let me turn to another theoretical approach to learning, situated cognition. It is a complicated area and here I will only outline its features, but it is an area which has a completely different view of mind from that of cognitive science. A crucial idea is that cognitive processes differ according to the domain of thinking and the specifics of the task context. That is, the way we think depends on where we are, and the specifics of the context and the tasks that we are doing. We don't think about problems or situations in abstract ways; we tend to think about them in relation to what we are doing in that situation. This leads on to an important second point, that there is an intimate connection between knowing and doing. Now, it isn't just that doing is an efficient way of learning (the old so-called Chinese proverb that ends with I do and I understand). Research shows that action affects thinking, and thinking affects action (e.g., Scribner, 1985). It isn't a one-way process; i.e, that a person first thinks and then does. When a person is talking, that talking is interacting inside the brain. The cognition is affecting thinking about the next words coming out and the words that are coming out are affecting thinking. This is crucial for technology education, because that is in a sense what we are trying to get children to be able to do; to think through their doing, and for the feedback from this doing to affect their thinking. Some science educators have thought about science for “everyday life” as opposed to science to understand what scientists do (Miller, 1996). What about technology for everyday life? Participating, living with technology, not participating in doing technology. This is an interesting debate central to the issues in this conference. Finally, the definition of problem solving. In situated cognition a problem is a “dilemma which a problem solver is emotionally engaged,” and that makes the problem authentic (Lane, 1988). This gives a completely different conception of problem solving than is normally offered. Often debates about procedural knowledge like problem solving are unproductive because we are arguing from different understandings of the nature of knowledge and learning. Contrast the situation of a cognitive scientist giving a “problem” to a subject and that situated cognitive view of a problem as a dilemma. Let me start by outlining how we carried out the research in design and technology, where students work on extended projects. copies of written work and photos of outcomes. We follow a design and make project, as it's called in Britain, over 6 to 12 weeks. We video-record usually 4 of the students, and try to video-record everything they do. This is a complex and uncertain process in a technology classroom. Four students may be sitting around the table, all working on something. Suddenly one gets up and walks to another part of the room. And then another one gets up and goes somewhere else. With one camera, selecting who to record is difficult and results in loss of data. We eventually wired students up with radio microphones so that at least we would hear what they were saying. Without these, students might go off to talk to the teacher and we wouldn't know what was discussed. Running after them, and standing behind them, listening to what they're saying is far from satisfactory. With them wired up, we could record four of them on separate audio tracks. However, dealing with that data is still complex; four tracks of audio with students simultaneously talking, but in often unconnected conversation at different times. It is essential to have observational notes that will record what students are doing, to make later sense of the data at the analysis stage. The video does not capture everything, not only in terms of following what students do around the classroom, but also because a particular shot may miss what the student is doing with his or her hands. For example the camera may be focused on the head, and when analysing the video you find yourself saying, “Drop the camera, drop the camera,” to try to see what the student is doing with her hands. Thus, trying to capture data is difficult in a technology classroom. Another aspect of data collection is student interviews and these worked best focused on the outcome of their project work. We also interview teachers, usually several. We keep copies of written work, any of the outcomes students produce, usually in the form of photographs. This all provides rich but very messy data for analysis. Now, let me turn to the findings of our research. One of the interesting questions is to ask what teachers think problem solving is. I do an experiment with teachers on in-service courses: I give out four sheets of paper about 6" x 6" and I say write on each a phrase or a sentence that tells you something about design, big enough so that I can stick it on the wall to be read by the group. When they have done this I collect them all in. And then I give them another set, and ask them to do the same for problem solving, and then the same for planning. I put them up on the wall under headings of design, problem solving and planning. The same statements occur under each heading, because there is no clear distinction among them in teachers' minds. This reflects a lack of clarity in technology education; as I said, the benchmarks don't distinguish clearly between design and problem solving. When we interviewed teachers, we obtained three quite clear ideas on problem solving. One is that they believe it is a general purpose skill. In Britain technology education involves work in food, textiles, in what we call “resistant materials” and “electronics.” Teachers believe that they are teaching students the skill of problem solving or design that applies across all those areas. As I will shortly indicate, this is not supported by research. The second view of problem solving is not concerned about the process of problem solving, but rather about setting students a problem, as a way of setting the scene for their work. Such teachers like to start with a problem. In medical education problem-based learning has become important (e.g., Alavi, 1995), but the focus is not on teaching problem solving per se. It is concerned to set a context for learning about medicine or learning about science, etc. A third approach is what we call “emergent problems,” something that comes out of situated cognition. That is, technology teachers will often talk about students who complain to them about how difficult technology is. When students complain about technology learning “lots of problems” they reply, “Yes, that's what technology is all about.” The technology classroom is full of all these problems, that happen all the time, as students work on designing and making projects. Although we have found these three distinct views of what teachers think about problem solving in technology, there isn't actually very much research on teachers' views. So this gives a topic for research in technology education. In the literature on problem solving there is very little evidence to support the view that it is a general purpose skill that applies across all areas or domains. As I noted earlier, cognitive psychology, for example, stresses the importance of domain knowledge. When trying to solve a problem, success depends on knowing a lot about the area within which the problem requires solving. In some sense, this is fairly obvious; someone working in electronics is not necessarily going to be terribly good at aircraft design or in solving related aerodynamic problems. It is necessary to understand the domain within which the problems are being solved. There is therefore a conflict between what teachers (and others) believe and the findings of research. It would be wonderful if we could teach a general problem-solving skill. In Britain there is a notion of “key skills,” which are to be taught as part of the whole school (also the university) curriculum, with problem solving being a central skill. The difficulty with this view lies in transfer; there is so little evidence for transfer. Where there is evidence, it is contested (Greeno, 1998). There has been a debate in educational research especially over the last 5 years on the nature of transfer and whether it is possible. (Educational Researcher has carried this debate.) We need to recognise this controversy and to understand the debate if we are to clarify the nature of technological problem solving. Now let me turn to what we found in classrooms. First, we often treat design or problem solving as a series of steps. An “algorithm” notion of design or problem solving characterises it as consisting of posing the problem and thinking about the problem, clarifying it, thinking of alternate solutions, implementing it, and then evaluating it. This can become a ritual which is set up and lessons become structured around it. But it is a ritual that does not affect the students' thinking. Asking students to create a predetermined number of ideas is one of those activities that become part of a ritual. (As I noted earlier, you have to have four ideas. We don't say why, but tell students they have to have four.) If you look at student work, at their design portfolios, it appears they followed such a procedure or algorithm, because it's all nicely laid out in terms of the problem solving or design steps. If you question them about their design ideas they say, “Oh, yeah, I created that fourth idea after I finished,” partly because of the requirements of assessment. They are required to show the development of ideas and gain marks for the number of ideas, and so they do it afterwards, and that's what is called a veneer of accomplishment (Lave et al., 1988). It looks as if they can carry out the process, but it hasn't affected their thinking. This also happens in science and mathematics. In mathematics when students are solving problems, the teacher sets them a problem, tells them how to do it. But they actually solve it a completely different way, writing it up the way the teacher wanted them to do it, because that is what they are supposed to do (e.g., Lave, 1992). In secondary schools there is some awareness of ritual in scientific investigation. But it is now appearing in primary schools, because primary teachers may not feel confident, and want an algorithm to teach students and they use worksheets that follow through this algorithm. What they may not do is affect student thinking about how to carry out an investigation (Murphy and McCormick, 1997). Our second finding relates to emergent problems. These are the problems students spend their time on: knowing how to cut something, how to join something, how to construct in a particular way, etc. These are the problems they are engaged with, not the one the teacher poses at the beginning of the project or lesson. Now, let me turn to the problem-solving strategies that students used. We spent a lot of time looking at the nature of problem solving in the video recordings we made, and could not work out what these strategies were. They certainly do not resemble the “algorithms” of problem solving that are so often taught. The first strategy is what we called “knowing the game.” This is where students try to work out the rules the teacher sets in the classroom, and play to those rules. 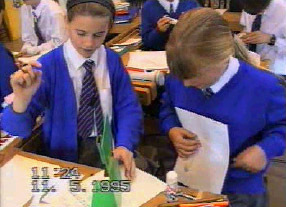 For example, two girls producing a mobile. One wants to do something that clinks when the wind blows, so has an idea of using metal, in the form of disks about two inches diameter. The other one has a moon and planets going around it, so wants some kind of glinting material. The first student plays the rules of the game. When the teacher takes them into the workshop and says, “Here are three boxes. One with metal, one with plastic, and one with wood,” the girl looking for a clinking effect goes to the metal box, picking out eighth-inch mild steel. But to cut disks two inches in diameter requires spending hours, first trying a large foot-operated guillotine, then tin snips gripped in a vice and finally a file. She ends up with very red hands, and takes a long time; a very inappropriate way of doing it. But she learned quite a lot about mild steel, as it turns out. When presented with the choice of the three boxes of material, the other girl looks over in the corner and sees some aluminium (not available to the class) and asks to use this. The teacher agrees, and she can cut this easily with tin snips. This girl took this approach many times throughout the project. She broke the rules of the classroom, knowing what she could and couldn't get away with. She experienced different kinds of issues and problems from the first girl, but she was avoiding certain kinds of problems. She may have known quite a bit about materials, to know which was the choice to take, but she experienced different problem solving from the other girl. The second strategy is finding a solution from someone who knows. That is the most common strategy. Let me illustrate this with an example of a moisture sensor, which is an ubiquitous project in the UK. (Every D & T classroom does the moisture project.) As a design and make exercise, the main focus is on designing a box to contain the electronics. Again we studied two girls. Girls give interesting insights into problem solving because of the way they work and some of the ways in which they test teachers. The teacher in this study defines the task in terms of making a box in which to put the electronics (the circuit, the bulb or the little speaker, switch, etc.). This has to be appropriate to the situation of detecting moisture or lack of it. He taught them to cut in straight lines because when he said “box,” he had in mind a rectangular box. He taught them to cut the material (styrene) in straight lines with a steel ruler and a knife. He also gave them a jig so that they could put the two edges together at right angles and run the solvent along to stick the two together. But one of the girls wanted to do the shape shown in Figure 1. She was detecting moisture (rain) on the washing line. She wanted her box to look like the sock hung out on the washing line. She encountered three problems. The first, cutting the shape A (Figure 1), is quite difficult, because the teacher had only taught her to do it in straight lines not the complex curves she wanted. She goes to the teacher and says, “What do I do?” He says, “Well, it's easy. All you do is mark out the shape you want, and just cut it slowly with the knife following the line.” And adds, “You'll have to put the two bits together for the top and bottom of the box, and then file them off so that they are identical in shape.” So she completes this task. Next she wants to produce the B shape (Figure 1) where the styrene must bend round the curve shape. The styrene they were using wouldn't bend around these corners. Again she asks the teacher, “What do I do?” His reply: “Just use the thinner styrene over there.” Again she carried out this instruction. The third problem was then how to stick A and B together. For the other two problems the teacher had an instant response, an instant solution. This time the teacher has to think about it, so comes over to the student's workbench, picks up the two sides of A, and looks, puzzles a bit, looks around the bench, and tells the student to hold one side. And so she holds one, and he puts the other on top of it, picks up bits and looks at it, starts to think about it, and says, “Right, cut 16 of these (small struts) and when you've done that, come back and I'll tell you what to do next.” What the teacher had done was to think about rigidity to hold the structure stable, and to create some surface area to put the solvent along. None of that was shared with the student at all. All the student received was the solution without being involved in the problem solving. This continually being “given solutions” becomes a culture of the classroom at the expense of a “problem-solving” culture. We find that teachers in elementary school, who work with younger children (10- and 11-year-olds), are much better. When a student comes up with a problem, the teacher asks questions about their problem, or poses alternative solutions (because sometimes students can't cope with the questions). They give them more than one solution, because what they are trying to do is engage students in the problem and the problem solving. Such a teacher has to set up a completely different culture in the classroom. It takes longer, and it is harder to do, but it is crucial to foster problem solving. The final strategy is the student collaboration model, and that happens in a variety of ways. One way is through co-operation. In D & T in the UK students are usually set individual projects, so they may be working alongside each other on a table or a bench or whatever, and they can co-operate because they're doing similar things; they are not identical, but similar enough to help each other. They will share ideas occasionally, but more often than not, they will simply share tasks; if one is good at soldering, that one will do the soldering; if one is good at cutting, that one will do the cutting. It's that kind of co-operation. The second form of collaboration involves then dividing the task up: “You do this bit, I'll do that bit. You're good at that and I'm good at this.” Some of the learning is lost in this approach. But at least it is a way of collaborating, because they have to put the two bits together at some stage, and that is good collaborative problem solving. The final form of collaboration occurs when they have a shared task, and they can talk about it. This requires the design of the task to require the students to collaborate. It has to be designed into it, so that there is no way the students can avoid it. These group tasks are difficult in Britain, because so much activity is driven by individual assessment; students have to have their own product and their own design. (This focus on individual assessment occurs because teachers have to report on each student's performance at ages 7, 11 and 14.) This prevents collaboration that would allow a joint problem, and hence some of the joint problem solving and sharing. Designed correctly the tasks should require any solution to a problem to be brought to the other students. In the real world of industry, individuals may work on their own with that work contributing to the overall task. They share the products of their work, not necessarily the process. However, it is important to remember that often people in industry are expert in the area in which they are working and students are not expert, they are learning, and they do not have the skills for all the contributing aspects. But how the problem solving is organized depends on your agenda. If your agenda is to make students expert in a part of technological activity, and make them learn to work with other people, then this “industrial approach” is right. If you want them to be involved in the thinking processes of problem solving, you need to do organize collaboration as well. It's not exclusive. Underlying this desire for individual work is also the students' desire to have a finished product that can be taken home. This leads to what a colleague and I called “the tyranny of product outcomes” (McCormick and Davidson, 1996). These four strategies of problem solving in the technology classroom differ from the way problem solving is depicted in the benchmarks, and the way we normally think about it. How common are these kinds of strategies? We need to know a lot more about whether these are consistent strategies across classrooms; another item on the agenda for research. As I indicated earlier, technology educators trying to learn something from science education in relation to conceptual knowledge is problematic. In science context is ignored, because abstractions are the important focus; science educators tend to ignore practical knowledge and play it down. It isn't just a matter of status of knowledge as in the philosophical debate that says practical knowledge is not valued because we value the power of abstractions (see Lewis, 1993). If a person can use an abstraction in a variety of situations, it is a very powerful technique. In fact few of us can do this, instead we work within our own domains, using science or mathematical abstractions within a limited range of situations. Practical knowledge is, however, an important element of technology education. Let me make a diversion into snooker (pool or billiards), a subject I have studied in more depth elsewhere (McCormick 1999b). Snooker with balls rolling around a table is a wonderful arena for scientists and mathematicians to work in. It is almost frictionless, with almost perfect impacts, and it is two-dimensional, and hence easy to analyse. For example, Figure 2 shows a classic interaction of a two-dimensional collision. If ball A collides with ball B, the theory is that B goes off in the line that joins the two centres (of A and B). Well, if you play snooker, you'll know it doesn't happen in this way. What actually happens is that, at the point of impact A is squeezed in the table surface (the nap) and ball B is thrown off the line that the simple geometry predicts. If you ever watch these games, you'll see the ball very seldom goes in square to a pocket. But mathematicians will deal with these collisions in this general abstract way ignoring the details of the context (the nap). Most mathematicians will also assume there is no friction between the ball surfaces when they collide. A second example is shown in Figure 3. If you hit the white ball to collide with the red ball, such that it goes along the line across the snooker table, then in theory, it should come straight back because there is no friction between the balls. In fact, what happens is it goes off at an angle, as shown in Figure 3, because there is a spin imparted to the red ball. Now, I use those two simple examples because there is quite a lot of complicated mathematics (including statistics) and science that tries to explain the behaviour of balls all over the table. Snooker players can not only hit balls accurately, which is one skill, but they can predict about 3, 4 or 5 moves ahead predicting where the ball will go after each successive collision. Most physicists will give up calculating after about two moves, because it's so complicated that they cannot do it or the problem is not worth the increased complexity. So, there comes a point where practical knowledge is absolutely invaluable and is sometimes as good as, or better than, the theoretical knowledge. That is an important point. In work on artificial intelligence, for example in chemical plant control, practical knowledge is important, because it is impossible to program the science equations for the operation of the plant. It's just too complicated. Dillon (1994) has given an overview of this approach to knowledge and shows how it is qualitative in nature, a point I will take up later. An illustration of this from snooker was given by a statistician who decided that he would produce a statistical model that could predict whether a particular shot was worth attempting (i.e., the potential score of a ball going into a pocket depending on what the conditions were). He built a model, which snooker players could use to predict accurately what shots they should try when faced with choices. They could use a calculator to determine the probability of success for given balls. The first assumption he made was that he did not consider what happened to the white ball after it hit the red ball. Not even a novice player would do this! That is a perfect example of ignoring the user of the mathematics. There is evidence from the UK Assessment of Performance Unit (APU) obtained when children were questioned about parallel lines. Given the lines in Figure 4, students were asked the question “Which of these lines is not parallel?” When 11-year-olds were questioned, 56 percent of them got it right, and 82 percent of 15 year olds were correct (APU undated). This is a question where the context of parallel lines is varied a small amount: some of the lines are longer than others, some of them are at one angle, and some another, some of them are offset. Often students are presented with parallel lines in mathematics as being horizontal, of the same length and even with arrows on them to tell them they are parallel. In this question there is only a slight change in context, and yet students are unable to move into the context. The technological context is more complex, in for example, orthographic projection (Figure 5), where there are many parallel lines, perpendicular lines, lines of reflection. Imagine, then, students who walk out of geometry class, where they can barely understand a slight shift in context of the way parallel lines are presented, moving into a technology class where no one tells them there might be parallel lines there, indeed doesn't even talk about them. (Our research has shown how tools, such as T-squares that automatically produce parallel lines, hide the geometry; Evens and McCormick, 1997.) Another set of questions tried by APU (1984a) in science considered reflection. Students are presented with various reflections and the context varied (Figure 6): “If these are bouncing balls, what do you expect to happen and which of these is right?” If the context is changed to “light,” rather than balls or if they are presented as abstract lines, then students are much better in answering the question in the context of bouncing balls than they are with abstractions, with the light context being in between. So with the same question, their performance drops across different contexts. Boys are much better than girls with the balls context, and the answer to this difference is found in the nature of pastimes of boys (Figure 7); they play snooker and billiards a lot more, so they know quite a bit about balls bouncing off cushions and so on. Interestingly, students do better in answering questions about spinning balls bouncing, which is a really complicated situation of the kind that happens typically in snooker, or when you play with a ball against the wall. There is no difference in the performance on such questions between boys and girls because they both bounce balls out of the classroom. They are better at performing in that spinning situation about reflection than they are in a simple one. This shows they are using the every-day knowledge of what happens, and we often don't capitalize on their understanding of situations. Rather we emphasise that science is counter-intuitive, and we dispense then with the real world that students inhabit. It is very important that we realise that children's knowledge is learned in context, and that they find it very difficult to move from one context to another. That is my explanation for the film of the graduates from MIT who cannot connect a battery and bulb with wires [shown at the conference]. It is not an issue of understanding circuits per se, it is that they understand circuits in a particular context. After all, they can do some really complicated things back in the laboratories of MIT, but a context change can fool them. We don't think much about the issue of moving from one context to another and how we teach students to do this. Another simple illustration of a change in context is shown in Figure 8, where the top representation of a circuit would be typical of that shown in a science laboratory. In a technology laboratory the bottom representation may be used. This lower technology circuit comes from AC representation where the bottom line should be zero voltage and the top one will be plus or minus. But this notion of “rails” requires an understanding of potential difference and of voltage. Many teachers use a “current” model and create complex explanations of current moving down the circuit, rather than the potential difference across the circuit. Children are supposed to transfer this notion of circuits from one area (science) where the conceptions and the way it's represented are quite different from that in the technology area. The effect of shifting context seems to be a fundamental area for research. The choice of materials for a job depends on their properties and on how they interact with other materials. Similarly, the usefulness of some manufactured parts of an object depends on how well they fit together with the other parts. 8B(6-8)#1. When a new material is made by combining two or more materials, it has properties that are different from the original materials. For that reason, a lot of different materials can be made from a small number of basic kinds of materials. 4D(3-5)#4. These are actually about chemistry, and about the theories of elements and molecules, etc. For most technologists this level is not important, except at the high end of technology, where the molecular structure might be important. What most technologists care about is the properties of the materials rather than molecular structure. Their principle concern is with the law that comes out of how the material behaves, stiffness, strength, these kinds of things. When a technologist is concerned about design constraints, the laws and the concern about behaviour of materials is central. But over on the science side the concern is with theories. How are these co-ordinated in students' minds? What is the interrelationship for them? Heat energy in a material consists of the disordered motions of its atoms or molecules. In any interactions of atoms and molecules, the statistical odds are that they will end up with less order than they began—that is, with the heat energy spread out more evenly. With huge numbers of atoms and molecules, the greater disorder is almost certain. 4E(9-12)#2. Linn and Muilenburg (1996) have written very interestingly about the use of the kinetic theory model. It is a theory about the interaction at the molecular level. Most students, when they are dealing with heat in school, need a heat flow model. They need to be concerned about relationships of temperature change across conductors or insulators, etc. This requires an empirical relationship. But in science the focus is on a theoretical view of heat, the model of heat flow. Linn and Muilenburg argue that it is not useful for everyday life. The heat flow model is what most adolescents require: many engineers also use that model, because it is often the most appropriate model. This gives us a problem of modelling an environment through a theory that does not necessarily relate to how we want to use the model in a technological sense. Almost all control systems have inputs, outputs, and feedback. The essence of control is comparing information about what is happening to what people want to happen and then making appropriate adjustments. This procedure requires sensing information, processing it, and making changes. In almost all modern machines, microprocessors serve as centers of performance control. 3B(6-8)#3. As noted earlier, systems require abstract representations and these abstractions of systems apply across all sorts of areas and practical contexts. It is an extraordinarily difficult idea, because of one simple thing: how you characterize the system depends on the purpose you're doing it for. Consider the example of a flush cistern in a toilet; the ballcock that regulates the level of the tank. If a variety of technologists are asked to draw a systems diagram of a cistern, they will produce different diagrams. It is actually very hard to draw such a systems diagram. But it is very easy to explain how a cistern works, and it is obvious to students. If you try to use a systems representation, it sometimes becomes more complicated than the practical system. Systems approaches aim to reduce complexity, not increase it! An example of a central heating system is shown in Figure 9. This is a system that is referred to in Benchmarks, that children in grades 6-9 typically should know. This system is extremely complex with primary and secondary inputs. Simple input, process, output systems are already complex enough at theses grade levels. For example, 13 year olds working on input (make-or-break contact), the process (transistor as switch) and the output (e.g., a buzzer). When such pupils are asked “What's the input?” they say, “The battery,” which is a secondary input. What may appear a simple system is a level of abstraction that students may not understand; another area for research, to explore across what range of situations it can be used, to see how understanding of complexity might vary according to age. Everyone in technology education thinks it is important to teach students about systems, that it is a central concept, yet we understand little about how students come to understand it. Let me look at an alternative approach, which has to do with qualitative knowledge, which I intimated earlier was important in technology. I want to start in the classroom with a project where students are making a little woodpecker moneybox (Figure 10). Money is put in at the top (right), the coin drops down and hits a horizontal “lever” (Figure 11) and drops into the box. This lever then rocks and it makes the bird peck on the other side (Figure 10); a simple mechanism. Consider the science of this mechanism and the fact that 11-year-olds are doing this project. When a coin drops through the coin slot and hits the lever the latter then goes out of balance (Figure 12). The size of the coin, and the distance it travels, will determine the momentum that it acquires. The rate of change of momentum when it hits the lever exerts the force, and the greater the distance and coin size will create a greater force. The “lever” (or beam) is counter-weighted on the left end because, unlike most of the beams in science, this beam has mass. There is also an offset pivot, and the length of that beam (on the right hand side) will determine the amount it swings when hit by the coin (it gives a mechanical advantage to the force of the coin). The pendulum is part of the lever system which will make that system swing, exerting a torque on the pivot. The bird (on the other side of the board; see Figure 10), the pivot, and the beam are all fixed together. It is also possible to consider that the bird itself will have a moment of inertia as it rocks back and forward, depending on its shape. Would it be possible to write the equations that would describe how the system works? If it was possible, it would be extremely complex, and hence unlikely to be successful and certainly not worth the effort. To create a system like that requires a piece of design thinking. The science will tell you about changing the size of the coin, about making the beam longer, etc. It probably will tell you to ignore the pendulum size, because it would not be possible to obtain the frequency resembling that of the pecking of a woodpecker. If engineers were trying to get this to work they would not use quantitative science but what might appear to be trial and error. In fact they would use qualitative thinking. They would know that if they increased the heights of the coin drop or made the beam slightly longer, and so on, they could eventually obtain sufficient movement in the bird for all coins. It is my view that we should start to teach this kind of thinking in technology education. It is not the use of quantitative ideas of science, but their use in qualitative terms. Although there may be successive iterations, it is necessary to have some concepts about what is to be changed. Otherwise, it does become trial and error, and it would be a random event if a successful mechanism is produced. Now, what I want to show you are some excerpts of classrooms where the students are working on this woodpecker mechanism and where I think qualitative knowledge is being used. There are two aspects of this qualitative knowledge. One is that it is qualitative, it isn't quantitative; thus I talked earlier of making “the beam slightly longer.” The other is that it involves device knowledge (Gott, 1988). We often talk about machines and the like not in the abstract, but in the particulars of the machine or device, and it is very evident in the classroom incident I will show, where the teachers and the students are using these two features of qualitative knowledge. In the first of the classroom extracts I will deal with, the students are just starting the project, and about to try to model the mechanism in cardboard. This modelling will allow them to get some ideas of dimensions and how the mechanism will work. The teacher has given them a model of previous students who used it for a rocking boat. Their mechanism will, however, have a completely different feel about it, so they have to redesign it to work in their context. The teacher is at the front of the class illustrating some of the ideas of the mechanism. Figure 13: Teacher illustrating rocking mechanism with his hand. Click on the picture to view the video (requires the latest version of RealPlayer). T: Transmit movement [from lever to bird] to the front . There is probably no other way the ideas involved could be explained for students to understand motion and how the mechanism operates. The phrase “to make sure it runs . [with a lever]” is device knowledge expressed in terms of the elements of the mechanism. Figure 14: Students working on the project after their teacher's instructions. About 20 minutes after the above incident, the students are back at their desk, and they start to fiddle with their cardboard model, trying to work out what will happen, and also talk about the model they have been given. P: It'll be in that position first of all, then it's going to go knock, knock. In saying “it will go knock, knock,” (and moving the bird at the same time) she is thinking about the device. In referring to the effect of the coins, she says the big coin (50 pence) is going to go “dong,” so that's the device thinking. The reference to going “to go really far” shows a qualitative idea, contrasting with the small coin (5 pence like a dime), then it will only move “a little bit.” So they are starting to reason about how the device works. Two important points emerge for me in looking at such incidents. First we should be developing students' thinking about machines and other technological devices, and second, such thinking is often hidden, because teachers, in the business of classrooms often cannot monitor that kind of interaction. But it is important that they talk about it. I think, therefore, that qualitative knowledge is a really productive area of research work in technology education. In carrying out research into both conceptual and procedural knowledge, there are, as I have illustrated, many complexities with which we have to deal. We often think about research methods in relation to methodological approaches, qualitative, quantitative, and critical as discussed by Householder and Newberry at this conference. However, we don't think enough about how it will affect what teachers do in classrooms, and how we understand those classrooms. In the end we want to help teachers, and then want them to be able to help the children they work with. Jim Rutherford's depiction of that process was that we should be very clear about the learning outcomes that we want to achieve and then we should set up the classroom so we achieve them and go in and research and show that it is effective. Now, that is one form of necessary research, but it is only one form. In the UK we adopted a similar approach to Rutherford's model. The Assessment of Performance Unit Design and Technology Project (APU, 1991) specified tasks covering design processes that children had to do to test the achievement of students. They collected some classroom and context data, but the focus was on student outcomes. To take this approach it is necessary to pre-specify what the knowledge and processes are in technology. If, however, the research and argument I have put forward in this paper are valid, this pre-specification is problematic. For example, they did not test the conceptual knowledge used in any design and make task. A second view is the Research and Development (R & D) approach. Ann Brown as a learning theorist takes this approach (Brown, 1992). She has a clear idea of the learning model (e.g., a community of learners) and how it should be implemented in the classroom. Such an approach requires changing the classroom to fit the theory, and then investigating in the classroom to see how the theory works. A third approach is through naturalistic studies of the classroom. The classroom is investigated to see what is happening, to understand the situations that exist there at the moment. For this approach the issues are “what informs the investigation” (i.e., what directs the data collected), and “what is done next after the research is carried out.” This latter issue is one for all approaches. The R & D approach has a problem with disseminating the practice when the theorists are not available and the teachers don't understand the theories: how do we transfer the teaching and learning ideas to other classrooms? We know that this transformation is difficult to “engineer.” Thus we need to be clear about how we move from the R & D to the dissemination around the education system. It is also necessary to be clear about the conditions under which it is successful, another layer of complexity. What works in one classroom may not work in others. keep a clear focus on what happens in classrooms and move from “what is” to “what ought to be” the situation. Alavi, C. (Ed.) (1995). Problem-based Learning in a Health Sciences Curriculum. London, Routledge. Assessment of Performance Unit [APU] (undated). A Review of monitoring in Mathematics 1978-82 Part 1 London, APU. Assessment of Performance Unit [APU] (1991). The Assessment of Performance in Design and Technology. London, School Examinations and Assessment Council. Assessment of Performance Unit [APU] (1984a). Science in Schools Age 13: Report Number 1. London, Department of Education and Science, Department of Education for Northern Ireland and Welsh Office. Assessment of Performance Unit [APU] (1984b). Science in Schools Age 13: Report Number 2. London, Department of Education and Science, Department of Education for Northern Ireland and Welsh Office. Dillon, C. (1994). “Qualitative reasoning about physical systems - an overview,” Studies in Science Education, 23, pp. 39-57. Driver, R., Leach, J., Millar, R. and Scott, P. (1996). Young People's Images of Science. Buckingham, Open University Press. Evens, H. and McCormick, R. (1997). Mathematics by Design: An Investigation into Key Stage 3. Report to the Design Council. Milton Keynes, School of Education, Open University. Garrett, R.M. (1988). “Problem-solving in science education.” Studies in Science Education, 13, pp. 70-95. Gott, S. H. (1988). “Apprenticeship instruction for real-world tasks: the coordination of procedures, mental models and strategies.” In E. Z. Rothkopf (ed.) Review of Research in Education 15 1988-89 (pp. 97-169). Washington DC, American Educational Research Association. Greeno, J. G. (1998). “On claims that answer the wrong question.” Educational Researcher, 26 (1), pp. 5-17. Hemming, G. W. (1899). Billiards Mathematically Treated. London, MacMillan and Co. Ltd.
Lave, J. (1988). Cognition in practice: mind, mathematics and culture in everyday life. Cambridge, Cambridge University Press. Lave, J., Smith, S. and Butler, M. (1988). “Problem solving as an everyday practice.” In J. Lave, J.E. Green, A. Schoenfeld, S. Smith and M. Butler (eds.) Learning Mathematical Problem Solving (pp. 1-21) Palo Alto, CA, Institute for Research on Learning. Lewis, T. (1993). “Valid knowledge and the problem of the practical arts curricula.” Curriculum Inquiry, 23 (2), pp. 175-202. Linn, M. C. and Muilenburg, L. (1996). “Creating lifelong science learners: what models form a firm foundation?” Educational Researcher, 25 (5), pp. 18-24. McCormick, R. (1992). “Curriculum development and new information technology.” Journal of Information Technology for Teacher Education, 1 (1), pp. 24-41. McCormick, R. (1999a). “Capability lost and found?” Journal of Design and Technology Education, 4 (1), pp. 5-14. McCormick, R. (1999b). “Practical knowledge: a view from the snooker table.” In McCormick and Paechter (pp. 112-135). McCormick, R. and Davidson, M. (1996). “Problem solving and the tyranny of product outcomes.” Journal of Design and Technology Education, 1 (3), pp. 230-241. McCormick, R. and Paechter, C. (Eds.) (1999). Learning and Knowledge. London, Paul Chapman. Millar, R. (1996) “In pursuit of authenticity.” Studies in Science Education, 27, pp. 149-165. Reed, S. K., Ernst, G. W. and Banerji, R. (1974) “The role of analogy in transfer between similar problem states,” Cognitive Psychology, 6, pp. 436-450. Schoenfeld, A. H. (1985) Mathematical Problem Solving. Orlando, Academic Press. Schoenfeld, A. (1996) “In fostering communities of inquiry, must it matter that the teacher knows the answer?” For the Learning of Mathematics, 14 (1), pp. 44-55.